The business was founded in 1950 as Haney Paint Center by Bill Haney and former employees of the old Hooper Paint Co. In 1957 Don Haws, president of Haney Paint merged with Tom Kucker of Kucker Paint forming the present company. Upon the addition of Elmer Miller, a former vice president of Solfo Paint the business became a major supplier of coatings to commercial contractors and industry. Needing room to expand, the business moved to its current location on Nottingham Way in Hamilton in 1976, and expanded to a second location in East Windsor, NJ in 2014, and a third location in Princeton, NJ in 2018. The business, carrying several well known paint lines has continued to grow with the addition of Benjamin Moore Paints, becoming a Benjamin Moore Signature Store in 2003. Soon, after remodeling, both locations of Kucker Haney Paint will transition from Signature Stores to Benjamin Moore’s “Store of the Future” with expanded color selection tools to further serve our loyal customers. In 1980 Tom Kucker retired, and in 1986 Jim Haws joined the company and currently serves as president. 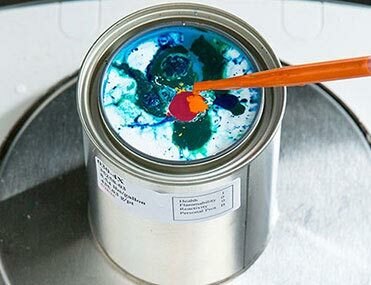 Kucker Haney strives to offer the latest technology, from industrial, residential, and architectural coatings to the newer low odor, low and zero voc interior and exterior water bourne paints. The employees at Kucker Haney have changed over the years, but all have worked diligently to satisfy our loyal customer base. They provide quality “how to” information, accurate color matching and technical support for customer projects. They take time to address customers by name, and are attentive to supplying them with correct products to complete their projects. At Kucker Haney, we feel that the personal touch and expert advice, along with our premium quality products allows us to compete effectively with the larger box stores. Classes and seminars are often provided for the community and contractors related to new products available, and trends in decorating and faux finishing. In addition to paint and sundries, Kucker Haney also carries a large selection of wall paper to give your interior a designer look. 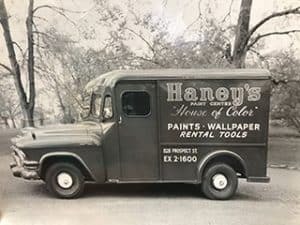 Family owned an operated for over 68 years, current president Jim Haws, and his late father Don Haws, both Hamilton residents, have worked to give back to the community that has so steadfastly supported Kucker Haney Paint. They have been active within the community and strive to benefit Mercer County with both their professional efforts, and personal involvement. Kucker Haney has served Mercer County and surrounding communities for many years, and hope to continue for many years to come. Thank you to all our customers for their loyal support. Kucker Haney Paint CO is at Kucker Haney Paint CO (Hamilton Township, NJ).